You can also see in the high resolution picture that I “cheated” and made the domain end a little bit below the table. I didn’t know the water would end up over there so it unrealistically stays up in the air. 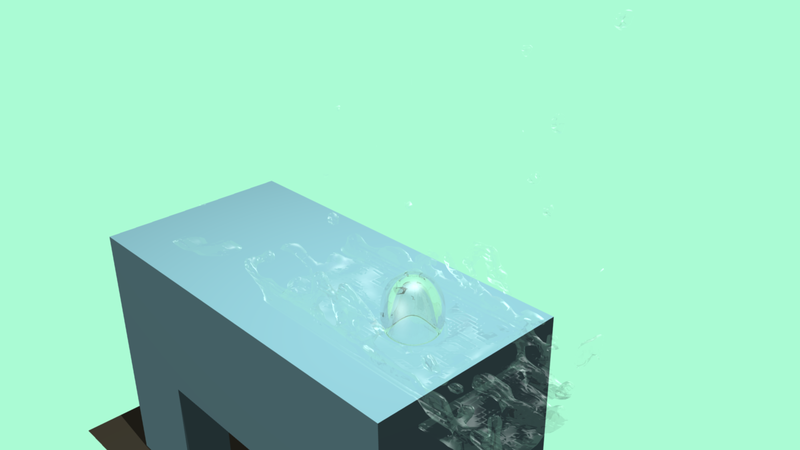 All the fluid simulation tutorials tell you to keep the domain as small as possible to keep the baking from crashing Blender (and possible your computer), but how acceptable this is depends on the camera angle and on how long the scene lasts. In the video you probably didn’t even notice it. But in a still shot like this, it’s a killer. I’m so happy to finally figure out what I was doing wrong. I’m not going to redo that demo because of how long the render times are now, but for my next one, now I know what to do. Rule of thumb: better-looking always equals longer render time. Especially when you’re doing anything to affect the light. Realistic fuzzy shadows, transparent objects, refractions, reflections, radiosity, media like fog and smoke.